Making this recipe was a two time attempt – I first tried the traditional method of making pho, which involved roasting beef bones, many upon many hours of simmering and lots of little steps. The result was fabulous, but with pho being so accessible and reasonable, making it myself like that wasn’t going to happen again. And THEN, came this recipe. When it popped into my reader, I was intrigued – could it really be as good as said? One try of the recipe and we were hooked. Yes, yes it could be. It is everything pho should be – simple, delicious flavours, comforting and now, quick from my own kitchen! Definitely give this soup a try – you won’t be disappointed. In a large pot – add the coriander seeds, cloves, and star anise and toast until fragrant, about 3-4 minutes. 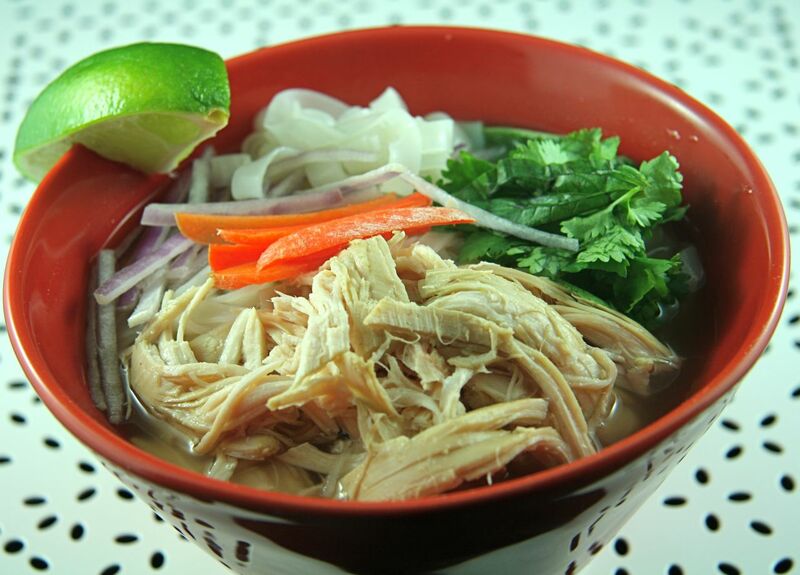 Immediately add the chicken stock, chicken breast, onion, ginger, sugar, and fish sauce. Bring to a boil. Reduce heat to medium-low and let simmer for 20 minutes, skimming the surface frequently. Use tongs to remove the chicken breasts and shred the meat, discarding the bone (if you used a bone-in breast). Prepare the noodles as per directions on the package and spilt between desired serving bowls. 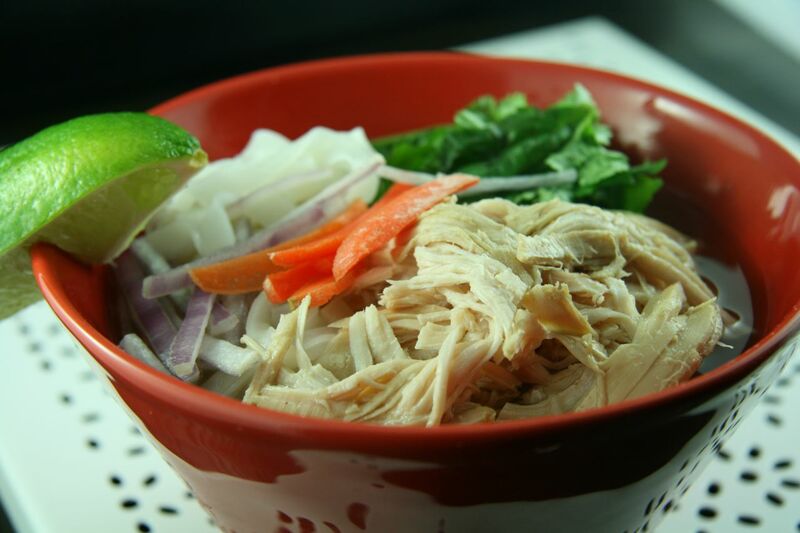 Ladle the broth into bowls and divide the shredded chicken breast into each bowl. Top with bean sprouts, cilantro, red onion, and other accompaniments as desired and enjoy. You know one of those recipes that you make again and again because it is so good? Well, this is one of them in our house. I’ve been making these for at least a year (probably more!) They are a great recipes to whip-up and have extra in the freezer for a quick meal and they are definitely great for company too. 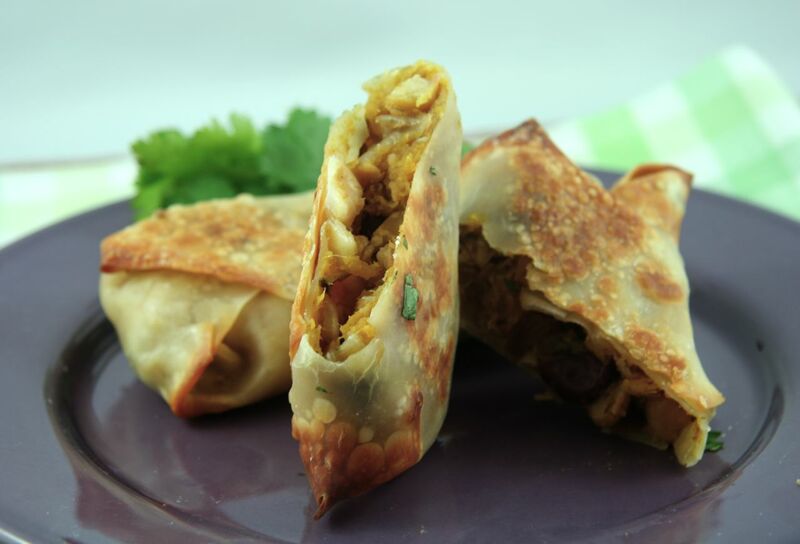 They take a little time to prepare (just because of the rolling) but they are sure to impress and important to note, they are very healthy and a great option for a meatless meal. What’s even better with these? 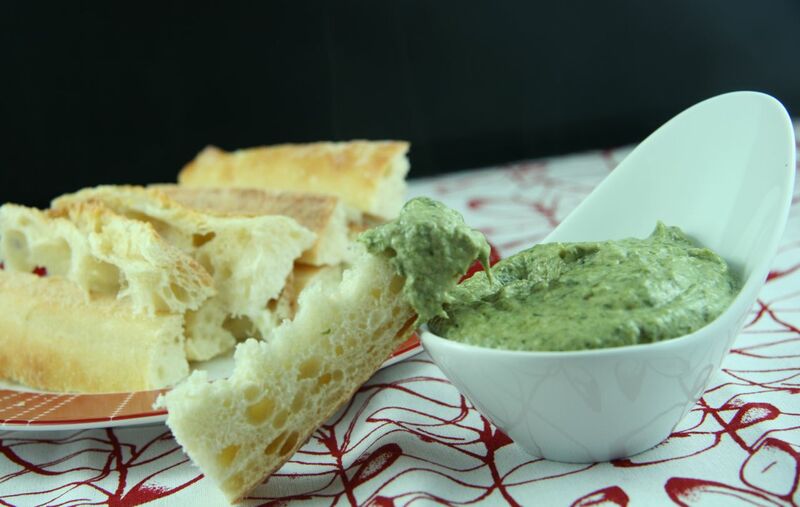 The cilantro yogurt dipping sauce shown here. TOTALLY takes them over the top good, and don’t worry, the recipe is also below. Usually I make these with black beans (as the title eludes!) but when I went to make them last week I was out of black beans and so was my local store (odd, hey?). So, I improvised, feeling confident because I had made them so often before. I used 1 can of chickpeas and 1 can of red kidney beans. Verdict – same result, same texture and just as good, so feel free to switch-up the beans to your liking. Definitely give these a shot (and be sure to make the whole recipe and freeze the rest, you’ll be thankful for a quick, delicious and healthy meal on the fly). Preheat the oven to 425 degrees. Wash and dry your butternut squash. Place the butternut squash, in its whole-form, in the oven and roast for 45mins – 1hour, or until a butter knife inserted into the flesh meets no resistance. Remove from oven, allow the squash to cool. Cut in half, remove the seeds and remove the flesh. (You can also cut the squash in half lengthwise, scoop out the seeds, and lay the halves cut side down on a parchment-lined baking sheet and bake for 25-35 minutes OR as the original recipe states, you can peel, dice and boil the butternut squash – however, I prefer to roast it, just because I feel as though it retains more nutrients). Meanwhile, heat the oil in a skillet over medium heat. Add the onion and cook for about 10 minutes, until softened. Add the garlic, jalapeño cumin, cayenne, salt and pepper, and cook for a few more minutes. Add the black beans and stir to combine evenly. Remove from heat.Place the butternut squash and the onion mixture in a large bowl and mash lightly to combine. These will be best if the mixture is left a little bit chunky.To assemble the egg rolls, place a wrapper on your surface with one corner pointing down (diamond position). Place a some of the squash mixture onto the wrapper, and use a pastry brush dipped in water to wet the edges of the wrapper (or use you finger and just dip in a small bowl of water). Fold the bottom corner up, then fold the outside corners in, and roll it all up. Place on a parchment-lined baking sheet. Continue until squash mixture is used up; it’ll depend entirely on you how many eggrolls you get because it depends on how much mixture you use per roll. It is generally between 25 – 30 eggrolls for me. Place a baking sheet in the oven while heating at 400F. When it’s hot, remove from the oven, spray with nonstick cooking spray, and place the egg rolls on the sheet. Spray the top well with nonstick spray. Bake for 20 minutes, turning halfway through. 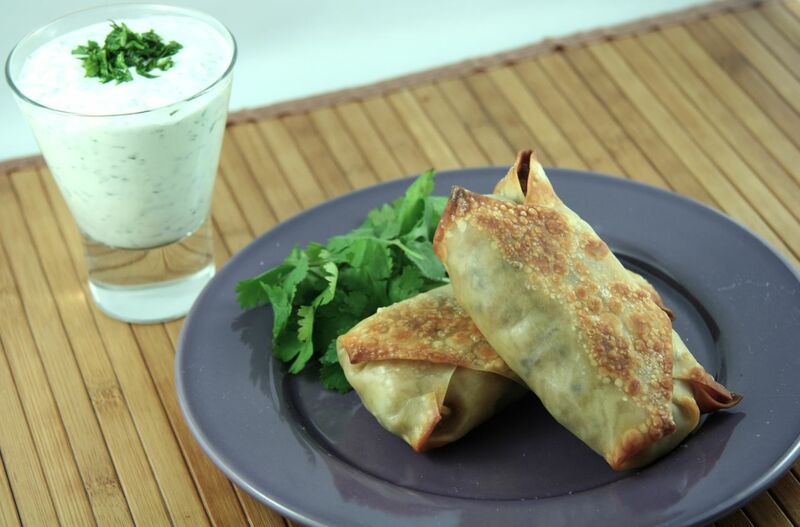 Extra egg rolls can be wrapped well in saran wrap, placed in a freezer bag, frozen and baked straight from the freezer, adding about 2-5 minutes to total cooking time. 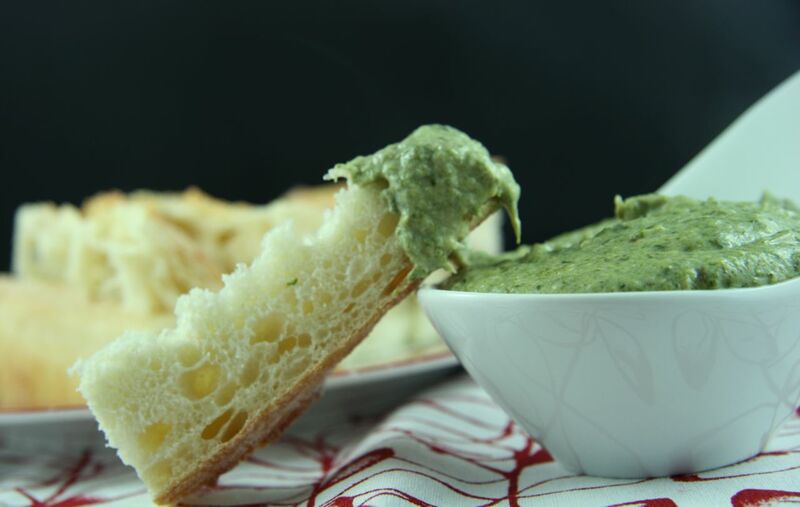 Combine all ingredients in a small bowl, whisk to combine and that’s it.